Region: Blue Ridge Mountains, located on Fort Mountain between Chatsworth, GA & Ellijay, GA. Located in the Blue Ridge Mountains of North Georgia. A Mountain Bed and Breakfast with Rustic Elegance. Straddling Fort Mountain and commanding a breathtaking view of the Chattahoochee National Forest and the Blue Ridge Mountains, the new (opened in the Fall of 2002), was designed and situated to take full advantage of its magnificent surroundings. Its rustic exterior blends into the environment, yet conceals elegant lodge accommodations. 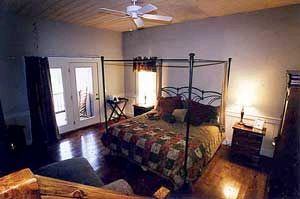 Guests at The Overlook Inn bed and breakfast sleep in richly appointed guest rooms. - each with a different personality, each with amenities such as private porches, hot tubs, gas fireplaces, and each with a spectacular mountain view.